I have been asked by coaches to show a sample practice plan, so I have included three below... (1) first practice of the season, (2) a mid-season practice, and (3) a tournament-time practice. Now these are just examples. We will vary the drills and skills, and the team skills from practice to practice. Certain skills should be practiced every practice, such as the ball-handling and dribbling drills, and shooting drills. Depending on your schedule, the amount of practice time you have and what your specific team needs are, you vary your drills. A rough rule of thumb for high school teams is to spend about half the time on individual fundamentals and half the time on team skills. If you are working with younger kids, you would slant this more toward fundamental skills. When teaching a new offense, defense, plays, press offense, press defense, and other team skills, select your drills and teach by progression. See "Teaching Basketball by Progression". 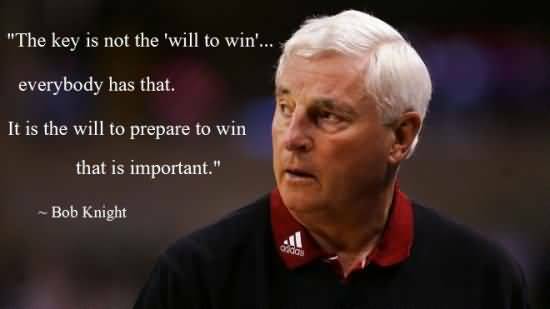 You must plan each practice. John Wooden has said he and his assistants often would spend more time planning a practice than the actual practice itself lasted. Keep a loose-leaf notebook of each of your practices that you can refer back to. After each drill or after practice, you can scribble additional notes on your practice plan from that day.. things that you have learned, or things that you feel need special emphasis. Don't just come to the gym each day without a plan and think you can just "wing it". You have to plan for success and plan your practices just like a teacher creates a lesson plan for his/her English or math class. Your practice should be like a classroom and you are the teacher. Stretching is done at the start of practice in order to avoid injuries (although some recent studies have shown that stretching really may have little value in reducing injuries). I always dislike wasting precious "gym time" on stretching exercises. So players are asked to come 10-15 minutes early and do their stretching on the sidelines, so we are ready to go once practice starts. This might not be practical, and you may need to do 10 minutes of stretching at the beginning. While the team is stretching, you can discuss your plans for the day, or explain what things need to be worked on, use the time to praise good things that have happened, reflect on your "quote of the day" (see below), etc. Select drills that help teach individual and team fundamental skils, as well as teaching what you are trying to accomplish, or trying to correct. Use the guidelines below. Select your drills from the "Selecting and Using Drills" page, which gives a brief description of each drill and about how much time to allow. You might have a "core" of selected drills that you use all the time. But you can throw in other drills from time-to-time to teach a specific skill, or just to avoid boredom and spice things up a bit. Move quickly from one drill to another. Don't spend half of your practice time on one drill. The kids will get bored and won't learn much after the first 5-10 minutes into the drill. If they mess up, they will get another chance to run that drill tomorrow. Whether you are doing 1-on-1 or 5-on-5 drills, shooting drills, etc., make them competitive with a winner and loser. We have losers do 5-10 push-ups. In free-throw shooting drills, we will often have missed shots followed by running a lap, as this simulates the running and fatigue in game situations. Budget your time for each drill. If you are introducing a new drill, play, offense, defense, etc, you will have to allow more time the first time. If you are reviewing something, like a set of plays or your out-of-bounds plays (that they should already know), move quickly through these... you are reinforcing their memory (a brief repetitive exercise that can be done each day). Follow an up tempo exhausting drill with 5 minutes of something less aerobic. Make them work hard, but don't be unreasonable. Do your free-throw shooting after an aerobic, running drill when the players are tired, in order to simulate the leg and body fatigue that occurs in the real game setting. Have every player do dribbling and ball-handling drills. I have been asked, "Why have my post players waste their time doing guard-type dribbling drills?" Doing these drills will make your post players better athletes in general, will help their overall coordination, and will improve their "hands". Also, how do you know a certain player will be a post player all his/her life (especially younger players). If you have a good assistant, you can plan some time for individual skills with perimeter players on one end of the floor, and your post players on the other end. See: Post Player Breakdown Drills, Guard Breakdown Shooting Drills, and Motion Offense Drills. Do not favor certain players in practice. Make them all work equally hard. Try to instill in your star players that they must lead by example, and be willing to work harder than anyone else on the team to be a great player. Don't ignore your "role players" (a better term than "subs", or "bench players")... make them feel they are contributing and encourage them. Early in the season, I would run a lot of conditioning drills. I believe your players and team will improve much more by doing conditioning drills than a lot of push-ups and running without the ball. If you are going to make your players run, make them do it with a ball... like full-court speed dribbling, using the right hand one direction and the left hand coming back. Rather than running a "gut buster", or a "suicide" (which is a terrible name), do a fast-paced aerobic drill like speed dribbling. The kids will get just as tired, will hate it just as much, but their dribbling and conditioning will both improve. Getting into tournament play, or a crucial game, you might spend most of your time on team skills preparing for the big game, working on any special situations necessary to play the upcoming opponent. For example, you might want to refine your press break, or your full-court press, or how you will defend a certain star player, or how you will attack their zone defense, etc. Later in the season during tournament time, we will often reduce our practices from 120 minutes to 90 minutes or less and focus on team skills and the upcoming game. It has been said that more tournament games are lost by over-practicing than under-practicing. Players can get "burned-out" by the end of the season. We want our tournament run to be fun... mostly looking forward to playing games, with short practices in-between. Whether to allow parents, spectators in the gym during practice is up to you and your philosophy. But make sure you have rules established from the start of the season. If you allow parents in the gym, make sure they understand that it is a classroom and they must keep quiet and not "coach" the kids from the stands. In the event that this becomes a problem, you reserve the right to close your practices at any time. End practice on an upbeat, positive note. We like to end our practices with a drill that builds team spirit. This is fun thing to end with. With our varsity and JV teams, we have each player shoot a shot from half-court. If no-one makes it, everybody runs. If just one player makes the half-court shot, NOBODY runs! So when a player makes the shot, usually the team celebrates with a lot of "high-fives" and hugs, since they don't have to run. Usually in our first practice of the year, we will tell our players that when someone makes that shot to get emotional and celebrate and be pretty happy about not running. Sometimes, when we feel we've had a really good, hard practice and no-one makes the shot, coach will have one of the assistants or a manager try a 3-point shot or free-throw to "save the day". Sometimes we will tell them that they don't have to run if John (the smallest player on the team) can dunk the ball in 10 seconds... they quickly realize that they must grab John, as a team hoist him up to the rim, as John dunks it. All these little things help build team spirit. NOTE: Also see Coach Ken Sartini’s practice planning form. Price: $79.00/yr After completing your purchase, you will be contacted by Practice Planner Live (usually within 24 hours) regarding setting up your account, access, etc. with Bill Self, University of Kansas Head Coach. Many more basketball DVDs at the Coach's Clipboard Basketball DVD Store! 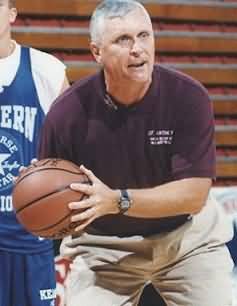 This page lists a number of basketball DVDs that focus on competitive practice drills from many of the best coaches in the world. Shooting, defensive and offensive transition, defense and end of practice drills are presented. Many more basketball DVDs at the Coach's Clipboard Basketball DVD Store! This page lists a number of DVDs dedicated to planning and organizing effective practices. with Don Meyer, Northern State University (SD) Head Coach; the All-time winningest coach in NCAA history.